Wishing stones and other bonuses lie along the paths too. At the end of the game your score depends on how far your figures have advanced along the paths, plus how many wishing stones you've collected. If you don't collect enough of them, you will lose points. The winner is the player who has the most points at the end of the game. 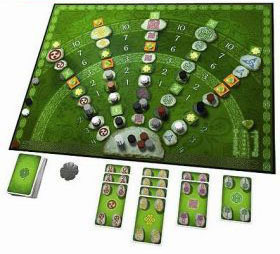 Each player takes 4 small figures, 1 large figure, a score marker and a large Celtic clover, all in the same color. With less than four players, the unused pieces stay in the box. Place all the figures on the board, on the large stone (the starting space) at the beginning of the stone paths. Put the score markers beside the first space of the score track. 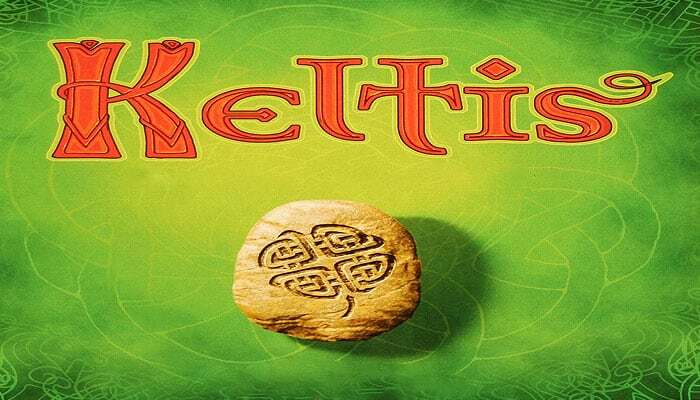 Each player places his large Celtic clover in front of him, so that everyone else knows which color you are playing. Shuffle the 25 path tiles and place one, face down, on each of the dark stones, and on each of the large stones at the end of each path. Then turn all of the tiles face up. Shuffle the cards. Deal a starting hand of 8 cards to each player. The other cards are placed as a face down draw pile next to the board. Note: If there are only 2 players, take 30 cards from the deck and return them, face down, to the box. There are five different stone paths on the board, all starting from the same point, but each leads to an end stone of its own color. The numbers alongside the paths show how many points a figure will score if it is in that row at the end of the game. Figures in the first three rows (minus area) will lose points; from the fourth row onwards the points are positive. The game ends when a total of five figures reach the final three rows, or goal area (row values: 6, 7 and 10) of the board. The arrangement of tiles on the dark stones is different every game, so the stone paths will always provide different opportunities. In the lower right corner of the board is a table showing the points that are scored for collecting wishing stones. Around the edge of the board is a score track. Use it during the game for recording points gained from taking path tiles. Players receive most of their points from scoring at the end of the game. a. Either discard the card, unused, face-up on a discard pile, making a separate discard pile for each of the five colors. b. Or place the card face-up in front of you, in order to begin or continue a path, making a separate column of cards for each path. Note: Each player may only have one path per color! If this is the first card placed in front of you for that path, move one of your figures onto the first stone of that path (row value: -4). If you already have cards for this path in front of you, lay the new card slightly below the last one, so that the values of all the cards remain visible, and advance your figure by one stone on the path. Either start with a low value: Each subsequent card of this color that you place must be of the same or higher value than the last card you placed in this color. Example: You could place a 3, then another 3, then a 6, then a 7, then another 7, and so on. Or start with a high value: Each subsequent card of this color that you place must be of the same value or lower than the last card you placed in this color. Example: You could place a 9, then an 8, then another 8, then a 5, then a 3, and so on. As soon as you lay out a card of a second value for a color you previously placed, you commit yourself to laying out all your cards of this color in that same order, either ascending or descending. Note: When a player's figure reaches the end stone (row value: 10), that player may play a valid card for this path and use it to advance any one of his other figures by one stone. Number tile: Advance your score marker the corresponding number of points on the score track. The tile remains face-up on the stone. Celtic clover: Move any one of your figures that are already on a path, including the one that you just moved, forward by one stone. If the figure you move lands on another tile then the effects of that tile are also carried out, and so on. The tile remains face-up on the stone. Wishing stone: Take the tile and place it face-up in front of you. The tile space remains empty! Take the topmost card from the face-down draw-pile. Or take the topmost card from one of the face-up discard piles. This gives the player 8 cards in their hand and their turn is over. The next player, in clockwise order, takes his turn and the game continues in this way. As soon as there are five figures in total in the goal area (the final three rows) regardless of which paths they are on. If the fifth figure lands on a tile in entering the goal area, the action of that tile is not carried out. The last card is drawn from the face-down draw-pile. Each figure on a path scores the points indicated, and the large figure scores double the points. If a player scores over 50 points, his score marker simply begins again at the 1, and 50 is added to the result. If a figure is in the minus area, that player must move his score marker back that number of points. For the large figure, the points lost are doubled. Figures still on the starting space score nothing. 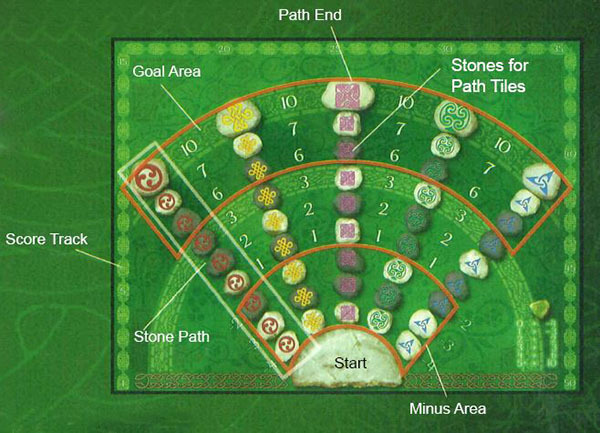 Players then score points for the number of wishing stones they have each collected, and they move their score markers forward or backward according to the table. The player with the most points wins. If there is a tie then there is more than one winner. (Variant: most wishing stones wins on ties).